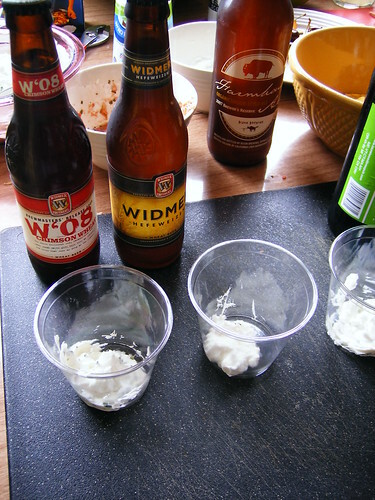 For the young chevre we ended up choosing two beers, both from Widmer. I really like both their Crimson Wheat (an ’08 summer seasonal) and their old standby Hefeweizen so we got a couple bottles of each for the sampling. 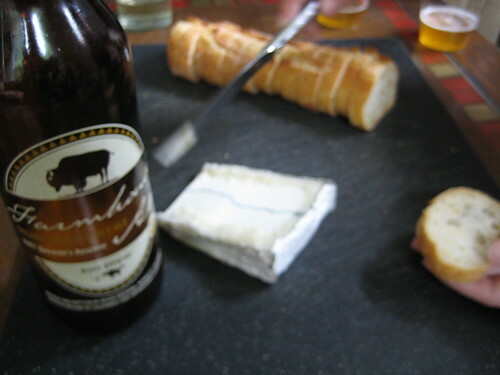 The second recommendation was to pair a slightly aged cheese like Humboldt Fog with a Belgian style Saison. Thom picked out the Farmhouse Ale from Bison Brewing down in Berkeley. It comes in a really lovely bottle with a sweet label. The last recommendation was to pair a firmer, more aged goat cheese such as a Garrotxa (ga-ROTCH-ha) with a porter or stout. We hemmed and hawed over this choice. Darker beers are sometimes difficult for people. My first inclination was to go with the reliable Deschute’s Black Butte Porter — it’s easy to drink and generally pleasing to most palates. However, we ultimately decided to go with Laurelwood’s Tree Hugger Organic Porter. Laurelwood Pub and Brewery is local here so I have no idea if you can get this outside of Portland or a well-stocked beer shop. The Hefeweizen is a crisp, lightly-colored, summery beer with a slight tang. Served best cold with a wedge of lemon for the rim. The Crimson Wheat is a nice maple color and tastes slightly malty with a touch of caramel and perhaps banana — a truly lovely summer beer. I seriously am in love with this beer. We sliced up some bread and mixed a taster of the fresh chevre with rosemary (from Amanda’s garden), left one plain (all were mixed with cheese salt) and a third we mixed with chives (from Sarah’s garden). We felt that this was a good pairing, nicely complementing and counter-balancing the chevre. It was noted that the Crimson Wheat seemed most delicious paired with the rosemary chevre and the Hef really shined next to the chives. Humboldt Fog from Cypress Grove is a creamy, slightly dry chevre with a ribbon of vegetable ash running through its center. It has a creamy layer at the rind and has a slight tang to it. We complemented this with the Farmhouse Ale Belgian-style Saison. The Saison also has a tang with a very fresh taste and is slightly bitter. There was nothing wrong with this pairing. Everything was right! 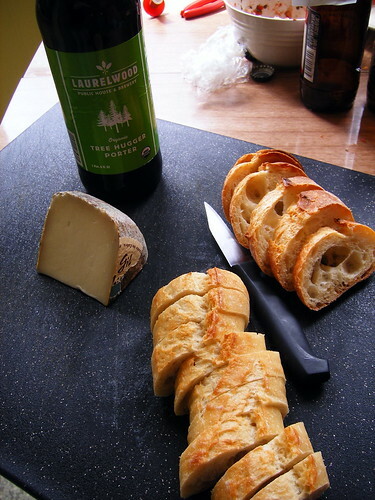 The Garrotxa is a light cheese with grainy “crystals” and slightly nutty flavor and was very complementary to the very drinkable and chocolatey porter from Laurelwood. All in all, I think the lesson here is that cheese and beer are a happy pairing. I think for summertime especially, when rich wines might not be as welcome, that putting out some beers to go with the cheese plate is a good idea. Having said that, I didn’t really get a transportational effect with the beer as I do with some wines. At the goat cheese tasting we did at Curds & Whey some months back, they paired the St. Olga with a lively red wine and the two together were divine. However, it’s easier and cheaper to have a couple beers on hand and rely on them as a cleanser to better enjoy the cheese. You can read more about beer and cheese in this San Francisco Chronicle article which has the recommendations we followed as well as more pairings. Sounds like tons of fun. Thanks for including us. Cheers!